Okay, I think I have a problem… I’m addicted to diaper bags! Seriously, can you have too many? I’m going to say no, my husband would say otherwise. 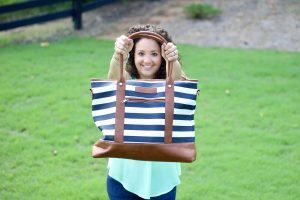 Today I’m sharing a beautiful bag with you all that is BIG and budget friendly! HOW CUTE IS THIS BAG? 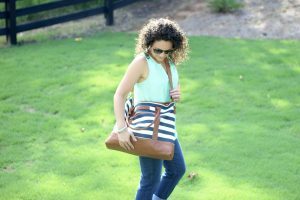 I’m obsessed with the blue & white stripes and brown straps and detailing. 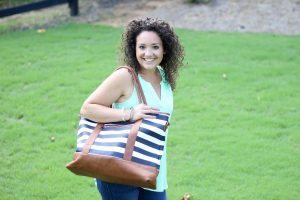 Mama Martina brings you beautiful diaper bags for an affordable price. 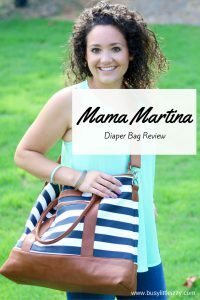 Click here to check out Mama Martina diaper bags and accessories such as wet bags, diaper clutches and changing pads. What are my favorite features of the bag? The strap options! This bag has stroller straps, can be worn as a tote or cross body as a messenger bag. 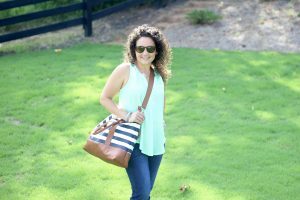 The this bag is a great size and so affordable, if you are looking for a diaper bag for you or a friend check them out. Watch me in action, sharing more about this bag on our youtube channel Sips and Tips with yours truly! More videos to come, get very excited and be sure to subscribe to my youtube channel. Thank you Ash, I’m really loving it too! Ok, I love that…and I love the strap options! Perfect! Yes, strap options are key!?? I am so obsessed with diaper bags too! Love this!!! Cute bag! And I’m headed to your YouTube channel now! I love this bag!! And I just watched your youtube video… LOVE IT! Thank you Nicole! I’m loving it so much! That bag is so cute and classy! Thank you! I thought so too! The price is too good to be true! I love that it has stroller strap options that is so perfect! Thank you Codi I love that option too!